The Standard Legal Marketing Partners Program is a proven way to earn substantial income by providing a simple and inexpensive solution to legal issues that are typically difficult and costly to handle, issues that nearly every person in the United States will need to deal with at some point in their lifetime. JOIN NOW! JOIN THE AFFILIATE PROGRAM WITH THE HIGHEST COMMISSIONS IN THE ONLINE LEGAL INDUSTRY! PARTNER WITH STANDARD LEGAL ON SOFTWARE AND DOCUMENT PREPARATION! Standard Legal offers quality legal forms software products, either as a download or on a mailed CD. Each title comes with complete legal forms, comprehensive overviews and instructions, and state-specific content. Standard Legal also offers professional Legal Document Preparation Services, where we create finished legal documents for the customer, ready for signature. With the wide variety of legal topics and legal products that we offer, the number of potential customers is substantial! Standard Legal's online shopping system has been fully optimized to convert as many visitors into buyers as possible. That optimization is critical. Promote our legal software products and send us pre-qualified website visitors, and we'll convert sales above the industry norm. So why partner with Standard Legal? Because we'll help you make more money! "I owned a pretty good domain name for a number of years but I was not making any money from it. So I joined Standard Legal's Partners Program, and I posted the graphics, informational copy and affiliate links that I received directly from them. I made money the next month -- and I've been making an increasing amount of money every month since." IS THERE A FINANCIAL REASON TO PARTNER WITH STANDARD LEGAL VS. OTHERS? Without question. Standard Legal offers the HIGHEST COMMISSION RATE of any legal forms software company in the industry -- BY FAR. Check our competitors' sites; most legal forms software sites and do-it-yourself legal forms companies offer a 20-25% commission to their affiliates (and some are even as low as 15%!). Standard Legal offers a 50% COMMISSION on its legal forms software! We also pay a substantial 25% commission on Legal Document Preparation Services, too. Why do we pay so well? We want to make your choice clear and simple when selecting an affiliate program in the legal forms sector: Standard Legal. We also provide a 30-day window on our affiliate tracking cookie; this month-long time period gives affiliates the best chance to generate conversions and commissions. And we want you to be excited about promoting such a high quality product that pays so well! It's that type of excitement that will allow us both to make money. "As far as I am concerned, Standard Legal is one of the best affiliate programs around. Standard Legal's online marketing materials are fantastic. The reporting, the monthly payments, and the overall quality of the software products make Standard Legal one of the best. Thanks for everything and keep up the good work!" 1) NO INVENTORY TO BUY: the vast majority of the purchases your customers will make are in a downloadable software format, so you don't have any upfront inventory expenses, as you have nothing to buy or warehouse! 2) NO SHIPPING TO HANDLE: the online downloadable products are served up to the customer automatically -- and you get the credit! And if your customer does purchase a packaged product, we'll handle the fulfillment for you! 3) A RELEVANT OFFER FOR ANY BUSINESS OR WEBSITE: because our legal software products and services cover such a wide array of topics, your website visitors and customers will love the relevancy of these offers! Use ads and site copy for products that best match the target of your site or business and watch your revenues grow! Do it yourself legal software, legal document preparation services, and professional version legal software makes for a well-rounded offering! 4) THE HIGHEST COMMISSION RATE IN THE INDUSTRY: All of the consumer software products earn an incredible 50% commission rate! Document Preparation Services pay 25% commission! And clicks generate a 30-day tracking cookie to boot, giving you plenty of time to earn money from your traffic! 5) HIGH PAGE RANK LINK EXCHANGE: once you earn a commission check from us, we will automatically place a descriptive link to your site from the home page of three of our associated legal web sites! In essence, we are creating a HIGH PAGE RANK link exchange that pays you money, too! Standard Legal is the BEST! We deal with FSBO home buyers and sellers from all across the nation, and Standard Legal Software is by far the best legal form software available, bar none! Home sellers pay a small price for total peace of mind to get the CORRECT legal forms for their transaction. Keep up the great service and the great affiliate program! HOW MUCH INTERNET OR COMPUTER KNOWLEDGE TO I NEED TO BE SUCCESSFUL? Candidly, to be highly successful, you must know how to market online. You certainly do not need to be a "coding genius" to participate in the Standard Legal Marketing Partners Program, but you will need to know how to handle basic html tasks. Standard Legal provides its Partners with link access to a fully functioning online storefront, and link access to specific legal topic product sales pages. So you will need to know how to create links from your web site or email content to our site. But we provide a series of detailed instructions and marketing tools that you can use to create these links. While deep "coding knowledge" is not a requirement, knowledge about online marketing is; knowing how to market products online is critical to the success of any affiliate. However, this knowledge can be attained by reading and learning. Check out our "Marketing Ideas to Sell Standard Legal Software" section for resources to help you learn best practices for online marketing. The online component is only one factor in creating success -- the other factor is USING WHAT YOU ALREADY KNOW ABOUT BUSINESS! We WANT you to bring your own sales and marketing experiences into the process! We NEED you use your previous business contacts and experience to make the Partners Program uniquely yours! If every one of our Partners used only the principles we provide to drive web traffic and generate sales, then we might all end up competing for the same base of customers (as large as that may be). Instead, we WANT you to create a marketing strategy that cleverly harnesses your lifetime of business experience! Think, create, build and grow the program within the niche that you've already carved out for yourself in this world -- and then watch the enormous financial success that builds! - Is the product offered a high quality one? - Is the market a wide-open one with a large number of potential customers? - Is it easy for customers to understand the value proposition of that product? - Is the brand well presented? - Is there a worthwhile margin to be earned on every sale? - Is there an opportunity for life-long income? - Is there a field-tested sales system in place? - Is the sales and marketing system outlined in a step-by-step way? - AND MOST IMPORTANTLY: will you be proud to call this "your business"? 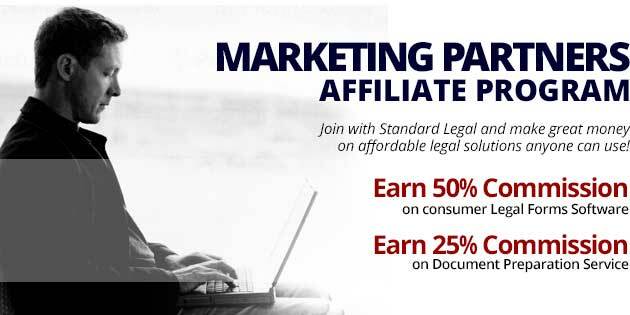 -Standard Legal has created its Marketing Partners Program with sales generating concepts and high-commissions in mind. As you can see, to every "venture evaluation question" posed, Standard Legal can confidently answer "YES!" Once you become a Marketing Partner, you will refer legal software customers to Standard Legal's shopping system through your own custom-coded tracking link. There are a couple of ways to link to Standard Legal effectively. See our page "Marketing Ideas to Sell Standard Legal". 50% commission on all valid consumer software sales. 25% commission on all valid Document Preparation Services sales. FREE -- no cost to join the program. A FULL LISTING OF ALL TERMS AND CONDITIONS HERE. - All Partner Program registrations must be approved by The Standard Legal Network. SLN reserves the right to reject any application for its Partner Program at its discretion, and maintains this discretion to terminate a Partner account at any time. - Affiliate tracking cookies are valid for 30 day. Cookies are not broken by subsequent affiliate clicks; the first click's cookie remains in place for the 30 day period. - The first commission payment will be made once $50 in commission is earned. (This is done to ensure that the program registration is not simply an attempt to obtain a discount on a personal purchase, with no plan on future efforts to generate additional sales.) After the first commission payment is made to a Partner, all future commission payments will be made monthly regardless of the total commission amount due. - Commissions will be paid only on valid sales; sales that are later refunded to the customer or charged back by the customer will not generate a commission payment for the Partner. Necessary adjustments will be made to commission payments in the month that the described action occurs. - SLN reserves the right to regulate the marketing of its products, services and brand name. NO PARTNER WILL EVER USE SPAM, SPYWARE, SCUMWARE, COOKIE HIJACKING, OR ANY OTHER MARKETING PRACTICE SLN CONSIDERS DUBIOUS TO MARKET STANDARD LEGAL OR ITS PRODUCTS. SLN retains full rights to immediately require the discontinuation of said practices at its own discretion on a case-by-case basis, and to immediately cancel a Partner account should it see fit.